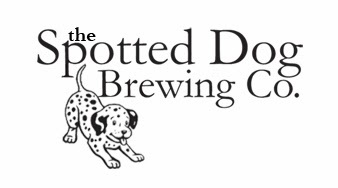 April 2014 ~ Spotted Dog Brewing Co. This is the last remnant of my dark beer brewing streak from this winter. I'd never really been a fan of imperial stouts/porters, even after trying many, until my friend left a bottle of Great Divide's Oatmeal Yeti at my house. Figuring I'd give it a try, I popped the cap and was totally blown away. The strange part is that after the Yeti I was changed forever and really enjoyed drinking imperial dark beers that I had previously despised. Weird, I know, but the evolution of my palate is weird I suppose. 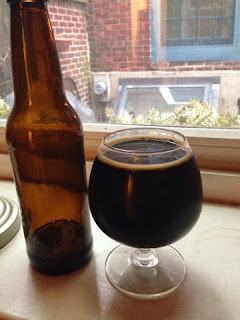 That being said, I went on a binge of brewing dark beers as previously acknowledged , and this was the last in the series. 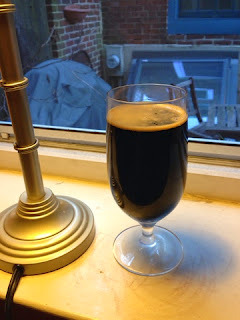 Loosely inspired by both Oskar Blues Ten Fidy and Hill Farmstead Everett, I wanted to brew a somewhat boozy, roasty and thick imperial porter. This is what I came up with after blending some aspects of various clone brews that I found online. A -- Very deep black with almost no ruby color along the edges. With a rough pour, you get a tan head around a finger thick that lasts for the first minute or so and then falls into a thin line ringing the glass. No real lacing. This should be improved upon for the next iteration. S -- Roast, chocolate, slight alcohol and a touch of coffee/espresso. Maybe a bit of toffee as well. T -- Tons of everything you'd expect in an imperial porter, but without any of the flavors being extremely overpowering. Definitely a slight touch of alcohol, chocolate, espresso, almond, caramel flavors. Finishes with some sweetness due to residual sugars from the high finish gravity. Might benefit from being a bit drier to bring out some more roast flavors. M -- Extremely thick and viscous. No real ability to feel the carbonation on this one, but that's entirely appropriate. O -- This is a really well done beer. Probably one of the better beers I've brewed. If you are a fan of the style, this is a solid example. I'll probably rebrew this in the summer and let it age until the weather turns a bit colder. 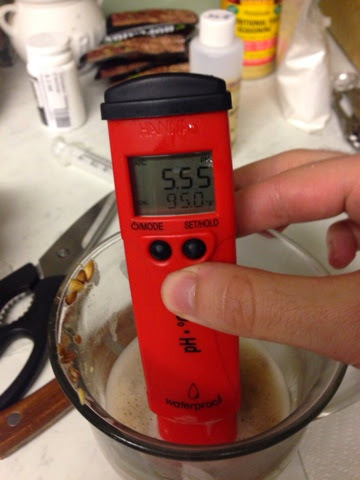 When the next major homebrew competition comes around I will definitely submit this. A - Jet black, slight head formation but quickly disappates to a ring around the edges. This is a common problem with my dark beers that I've yet to overcome. S - Quite a bit of coffee on the nose with a bit of chocolate. Almost smells like my coffee in the morning thats dosed with a dash of chocolate milk. This is more or less what I was trying to accomplish. T - All coffee with a bit of residual sweetness. Almost no chocolate, maybe a touch on the finish. M - Quite thick. Could probably benefit from a slight increase in carb volume, but it feels how a stout should, in my opinion. O - I'd definitely brew this again, albeit with a few tweaks. I'd definitely dial back the coffee a bit or spring for some better coffee. For this batch, I just went ahead with the Peet's Major Dickinson blend. Living in Philly, I'm surrounded by hipster coffee shops, so I should be able to do better than this. Also, I'd probably up the dosing of cacao nibs by increasing to 7-8oz instead of the 5oz. I get a bit of chocolate in the nose, but not at all the flavor I was seeking. Also, I might mash a tad lower in the hopes of drying it out a bit more to remove some of the residual sweetness. 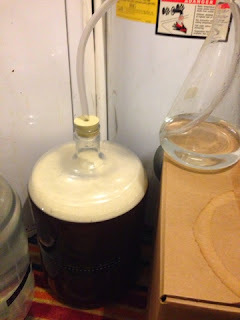 Definitely will brew this again though in the fall.